Did you ever wonder what it would be like to shoot a monster with a cannon ball and watch as it explodes? Well you don’t have to wonder anymore because developer Steve Hoffman has brought you Doodle Cannon, an iPhone, iPod Touch, or iPad app game that you can buy for $0.99 or $1.99 if you are buying it in HD for your iPad. The game’s graphics are modeled after the art of doodling with squiggly lines and a grid paper background. You have the option of playing by yourself or with another player as the game offers a P vs. P choice. There are 30 levels in this game, and even after you have completed them, there is the added challenge of going back and trying to get gold medals in all of them. For each level you complete you get, either an x or a gold, silver, or bronze medal depending on how many attempts it took you to take out the monster. You can also use the points you receive from the medals to shop for cheat items. The three items from that list include, a level skip, touch bomb, or roll bomb. The basics of each challenge are pretty simple. On the left is your cannon, in the middle is the monster, and on the right is a button you use to control the force of the shot. You can tilt the cannon to your preferred angle and then hold your finger down on the red button titled, “fire” until you have hit your desired force level and then release. As the levels increase so do the obstacles with the introduction of walls, moving blocks, giant balls, and rods. The breakdown of the levels is laid out like a calendar and you have the power to jump back and forth between them. The game is all about the pressure and angle of the shot, and your ability to finesse the cannon ball through obstacles to land right next to the monster in time for the cannon ball to go off and send its head flying. 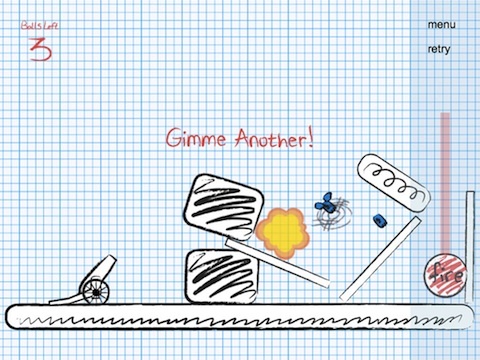 Doodle Cannon grows on you and becomes completely addictive. I am currently working on changing all of my x’s, silvers, and bronzes in to golds. AppSafari review of Doodle Cannon was written by Vanessa Paszterko on June 28th, 2010 and categorized under Action, App Store, Fun, Games, Strategy. Page viewed 4142 times, 3 so far today. Need help on using these apps? Please read the Help Page.